Pinterest is an excellent tool for curating links, which makes it ideal for teachers to use. I teach in a 1:1 Mac school and am always looking for educational technology resources to incorporate into my curriculum. I've compiled a list of my top eight boards based on their content. 1. Quality of pins: the links need to work, aren't spammy, and are geared for teachers to use in their classrooms. 2. Variety of pins: the links should cover multiple grades, levels, and subjects; this makes it easy for a technology coordinator, librarian/media specialist, and/or administrator to find resources to share with all their teachers. 3. Number of pins: in order to offer the wide variety and good quality, the boards needed at least 100 pins. 1. All Things Technology by Mrs. Lirette's Learning Detectives (Mary Lirette) (6,198 followers; 812 pins) This collaborative board is comprised of a wide variety of teachers who have curated an astounding number of links that may take you days to peruse, but well worth it! 2. 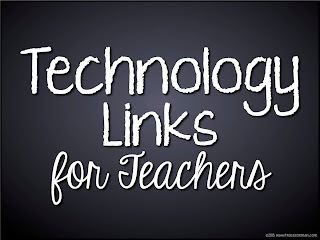 Free Technology for Teachers by Richard Byrne (3,076 followers; 729 pins) If you follow Richard's Free Technology for Teachers blog (and if you don't, you should! ), this is an excellent collection of links to complement it. 3. 1:1 Technology by Mrs Orman (4,341 followers; 468 pins) OK, so this is my own board, but there has to be some perks in writing the blog post, right? I promise it's worthy of the criteria. 4. EduTech Resources by Erin Klein (5,268 followers, 443 pins) All Kleinspiration fans should follow Erin on Pinterest, too. Her boards are as rich in content as her blog. 5. Classroom Technology by We Are Teachers (7,746 followers; 180 pins) You know they have teachers in mind when you browse their pin boards. Make sure to follow their Teacher Humor board, as well. 6. Teaching Ideas and Apps by Cool Cat Teacher (Vicki Davis) (5,808 followers; 177 pins) Vicki's board always contains informative and resourceful links. 7. What the Tech by Toby -Wan Kenobi (Toby Price) (663 followers; 147 pins) The Jedipadmaster is just as entertaining, thought-provoking, and rewarding to follow on Pinterest as he is on Twitter. All schools should have an administrator like Toby. 8. Technology by The OC Blog (Charity Preston) (23,493 followers; 140 pins) Charity is the queen of organized classrooms and her technology board is no exception! I have an honorable mention list I will post at another time. These may not have excelled in all three areas of criteria, but they're still pretty darn good boards to follow. What are your favorite educational technology boards? Link your favorites in the comments below.